They’re done! And such perfectly appropriate socks to wear on May Eve. I’m quite pleased with the way these turned out. 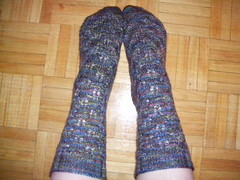 For all that it’s a lace pattern, there is a lot of stretch in it, so the’re fitting me quite snugly, without sagging. 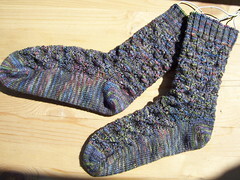 The short-row heel also came out well, and is fitting nicely. Project Timeline: March 19th? to April 28, 2007. That’s right, folks, a spinning wheel in my very own living room! I barely can believe it, for all that I’ve had this lovely Ashford Elizabeth wheel since Saturday night. I don’t know how to write about it and its acquisition. I want to tell you the details, and I want to make a (pseudophilosphical) point too. I suppose I haven’t yet found my authorial “voice” (but best leave that for another post, eh?). That would have been enough to make my day a success, but after playing with fleeces to my heart’s content (read: got guilty about happily combing up lots of someone else’s fibre) I broke out my own spindle and went to talk with some people I know. Another woman I know peripherally was sitting with them, working on some stellar embroideries (period/natural/hand-dyed threads!). I didn’t notice it at first, being hidden behind a large embroidery frame, but this lady had a spinning wheel back there, and (of course) when I did see it I excitedly asked her to show me how it works (never having seen a wheel “in action” before). She said sure, and got it set up. She put some roving to the leader, and began spinning; I watched in fascination. After about half a minute she passed the roving over to me and treadled, and then asked, How did I get here? I confusedly answered, Our car. She asked, Was there room in it for this? I looked stupid, and maybe sputtered a bit before catching on and answering, Yes! Now the way I see things, there is a magic that surrounds fibercraft, something that encourages people to be open and free with their knowledges (and supplies!). To pass it on. 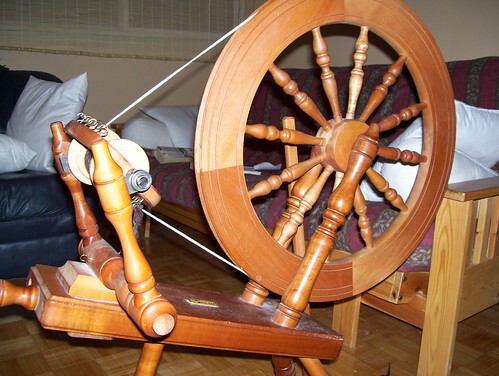 Like a spinning Wheel, it turns and turns, and with each rotation helps to create something new. I want to learn; what I need comes to me. I want to teach, and so I try to put out what I can, here on this blog and in person. The Wheel of Fortune turns, bringing new experiences, granting things that are needed as they are needed, knowing that you will be its instrument in a future cycle. The fact that I have a spinning wheel on loan for the next few months from a woman that doesn’t really know me has confirmed these things for me. I hope that in some future turning I may do the same. I also just really like that the entire issue of the magazine is online; that’s just nifty. 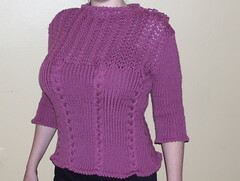 Does anyone else know of some truly vintage knitting patterns on the web? 1) Why do you like (or, dislike, should that be the case) chocolate? First off, I do, very much so, like chocolate. I know that there’s lots of science that explains the happy-making tummy/brain chemistry of chocolate, but really I think the reason why I like it is that it is a sweet treat (I have a very sweet tooth!) with a warm and complex flavour. It is both exciting and comforting at the same time. 2) What’s your favorite knitting tool? Odd question, this. 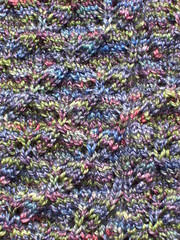 Ignoring the scarcastic part of my brain that says “um, needles?”, I think first I have to confess one thing: I am a knitting cheapskate. (Actually, my drop spindle escapades should illustrate this full well!) I don’t really have a tonne of knitting tools, and even the basics that I have are pretty bottom-tier. So, while I’d like to be able to say something like “my Lantern Moon ebonys” or “my electric ballwinder”, I think my favorite tools are the things I can make on-hand as neeeded for the project: safety pins or twists of wire for stich-markers, a Swiffer handle “nostepinne”, a shoebox “lazy-kate”, what ever I need at the moment and can cobble for myself. Maybe that really makes my favorite knitting tool my odd brain? Tell me about 3 Amelias that you know (historical, fictional, or real). ~ Amelia #2 (fictional): Amelia Bedelia, that amusingly literal-minded maid from beloved children’s books. I think as a kid, I liked reading about her becuase she also had the Name, and was a bit sillier/scatterbrained than I was. ~ Amelia #3 (real): Amelia Coleman, my great-Grandmother. My Grandma was always telling me how I must have inherited my creativity from her: as a wife and mother, she taught piano to bring in extra pin money and apparently preferred handicrafts to housework; as a young woman she was once commissioned to sing before Queen Victoria. I wish I could have met her, across the ocean and the years, but I like to think that I have inhereited more than just her name. 4) What career path did you not take, and why? Nearing 30 and barely having a career path at all, this is a touchy one! Most recently, however, I have chosen not to pursue a PhD, something I truly thought was “for me”. Last year, as I was completeing my MA, I was seeing sides to academia that I really didn’t like, things that made me hurt and angry. When autumn came (the time for applying to PhD programs), I let it pass, no applications, no contact with professors. There was still too much frustration inside when I thought about being a student again. Lately, there is less anger, but I think that the distance has let me think about academics as a career choice with a broader perspective. There are still many things about it that lure me, teaching being the topmost (oh, how I would love to just speak to people about reading good books! ), and I know that every job comes with its own set of stresses and sacrifices. I’m just not sure it is “for me” though, and until I do know, I’m going to see what else there is in the world for me to try. I do think that I will get a PhD someday, but it may be more to satisfy my ego than to reclaim that career path. 5) In what ways does your fiber habit make you a better person? When I knit or spin, I am usually calmed, finding a peace in the rhythms of fibrecraft that I don’t get through music, embroidery, drawing, or whatnot. And even those times when I’m swearing like a sailor as I rip out sitches or drop the spindle again, these moments teach me to have patience, to believe in my ability to fix my own mistakes, to not give up. else in the same post. For St. Jodi and International Pixel-Stained TechoPeasant Day, it it time to share art. Before I was a “knitter” I was considered somewhat musical, and a “bard” within the SCA. The Bardic community at large has always been so open and inviting, so full of knowledge and always ready with words of encouragement, they seem to embody the ideals behind this commemorative day. So, here are some “bardic” mp3s for you! In honour of peasants everywhere, first I give you The Poacher’s Song. Lyrics and music by myself, recording/backing vocals/many instruments by the lovely Heather Dale. And for the heck of it, here’s Bedlam Boys, a fine trad/folk piece recorded at the “Bardic Kitchen Party” a few years back (backing vocals/percussion by many of the Ealdormere Bardic College). The recording is rough and live, but I’m sure you can tell we were having fun! If you feel like investigating the original albums these tracks are from, check out http://www.amphismusic.com/ . I personally don’t have a full CD recorded (just a few of these “cameos”), but I know many of the wonderful artists who participate in the Amphisbaena project. For now though, the tracks above are “mine”, and I give them to you freely and gladly! As Nutella to toast, consider the word spread. On a somewhat related note, I sent away my Knitters Treat Exchange package today. I really hope that the recipient likes it! I got a very intriguing and amusing card from my SP10 pal yesterday, so now I’m all buzzed to see what ever I might get next, myself. I really am digging this reciprocal exchange thing, so I’m also very interested to see what will arise in the blogosphere on “Pixel-Stained Techno-Peasant” Art on the Net Day. I trying to see if I can come up with a pattern in time (not bloody likely! ), so you might get some folk-music out of me instead. 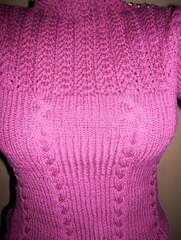 Not bad, for the first sweater ever knitted for myself! 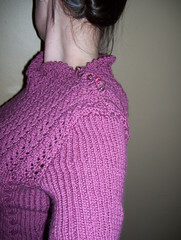 Modifications: Some fiddling with the sleeves in order to achieve the required length. Project timeline: Fall 2006 to April 2007.